Like us here in Canada, Sarah has had some unusual warm winter weather in Illinois. 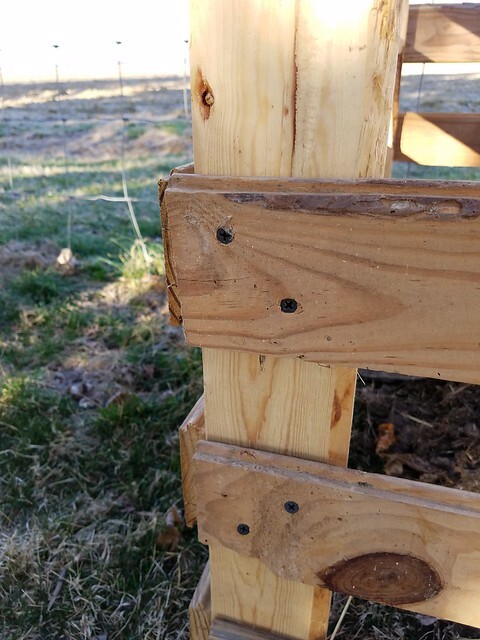 She took advantage of the spring-like temperatures recently to do some building outdoors. 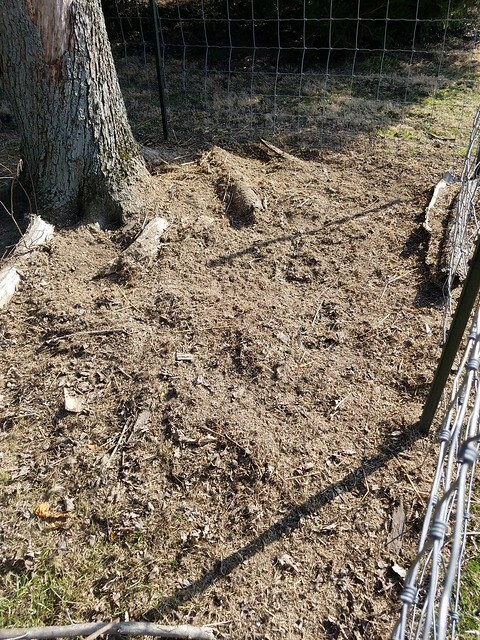 Her compost enclosure is something I’ve considered for our farm, so I enjoy seeing how she tackled it. Last weekend we had unseasonably warm temperatures. When the forecast said that we were supposed to hit 70F (21C–thanks for the Celsius translation, Sarah!) on Sunday I decided I had to do something outside. 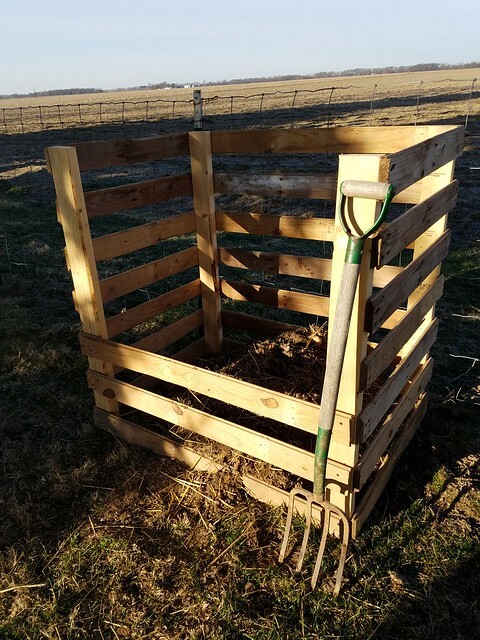 One of the projects that I wanted to work on was my compost pile. At that point, I literally had a pile. Basically, I just threw my scraps and yard waste into a corner of the chicken’s pen. The chickens helped me by scratching and turning over the pile, but pretty much we just had a mess. 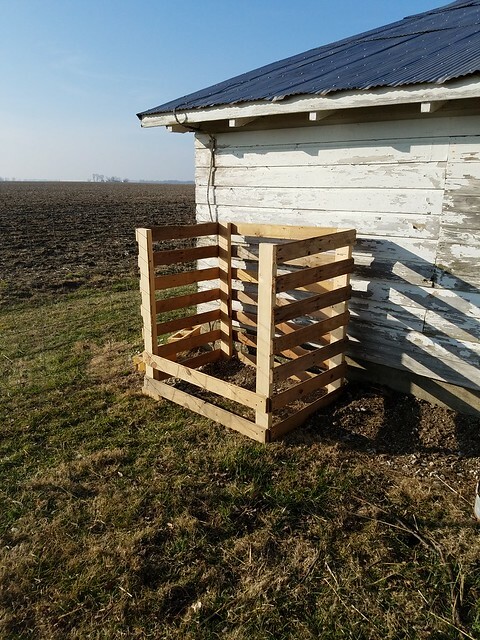 I have a pile of wood scraps in my barn so I had plenty of supplies to make something to corral my compost. I started by taking a 2×4 and cutting it into four 42 inch pieces for the corners. I found some old scraps of wood siding to use as the slats. 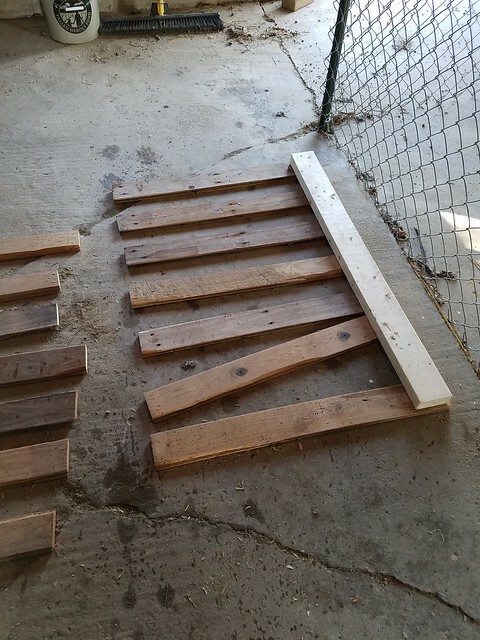 I cut the slats for the sides at 30 inches and the slats for the front and back at the 42 inches. I first assembled the two sides. I laid them on the floor and used screws to attach the slats to the corner pieces. 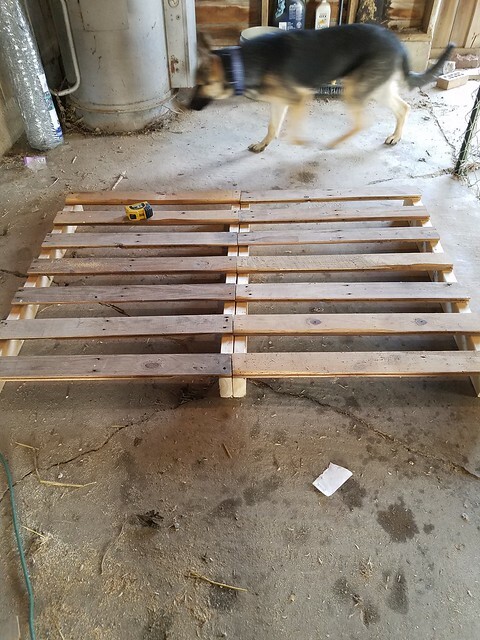 Once I had the two sides done, I just had to connect them with slats for the front and back. I didn’t necessarily have to add slats to the front but it did help make the structure more stable. 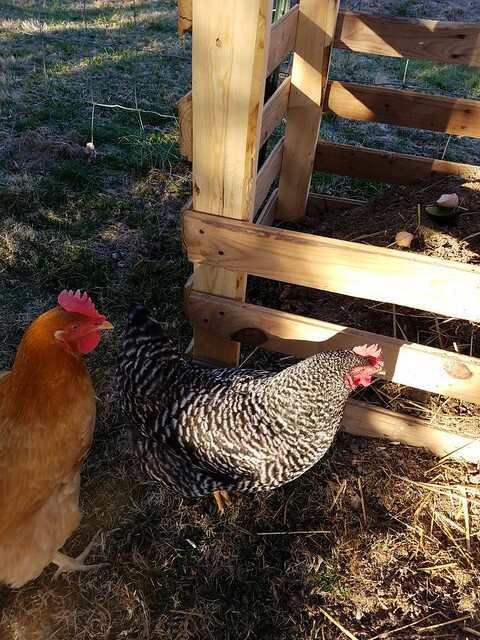 Also, since I knew that the chickens would help me turn the compost over, having front slats also helps keep the compost inside. Once I finished I was very happy with the outcome. However, Steve pointed out something very important. Compost can get very hot when it is breaking down. 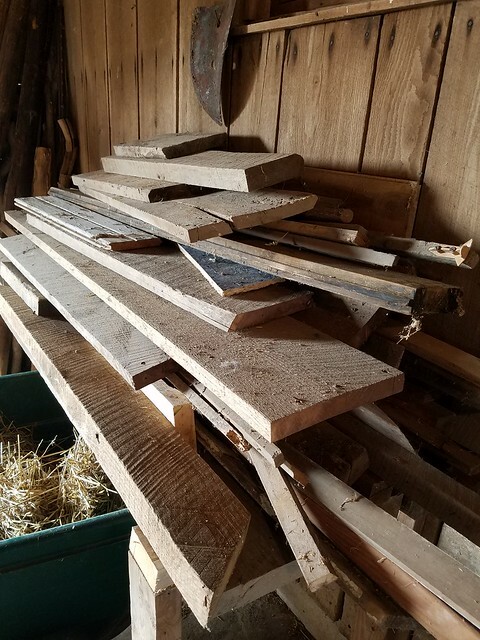 The chances of my pile catching fire are very slim, but there is no need to risk anything, so I moved the pile away from the barn. Now, all I have to do is add more scraps to the pile, turn it over occasionally and wait. Compost is “black gold” for gardeners, so I am excited to turn food scraps and yard waste into a nutritious fertilizer for my plants. This will be so helpful for your garden, Sarah. The enclosure seems like a good way to keep the pile tidy. Gardening season is coming soon! What does it say about me that this didn’t look massive? 🙂 After five years 129 acres is my norm apparently! I’ve seen plans for making a compost container out of a 5 gallon bucket! You can make one that works for your use, I’m sure. I will look into that, the issue is that usually if you don’t have a big enough yard the neighbors will complain about the smell! Well done! Air for circulation, access for the chickens, it’s great. This will be such a help. Thanks! I can’t wait to fill it up.